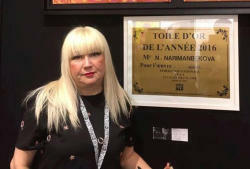 Azerbaijan’s world-famous artist Nigar Narimanbekova has displayed her works in Paris as part of the contemporary art fair "ART 3F", Trend Life reported. The fair opened with a solemn ceremony on January 27at the largest exhibition centre of Paris - Porte de Versailles. ART 3F is shifting the boundaries of traditional contemporary art trade fairs by giving these cultural events back their warm, human side. Narimanbekova presents her series of paintings "Love Toys". The artist said that the Grand Jury made a decision on which works will be displayed at the fair, while requirements were incredibly high. "I'm very glad for one more victory - the legendary ART 3F, where I once again represent my Azerbaijan,” she said. The very best artists, sculptors, mosaicists, with their unique style have been selected by the jury. 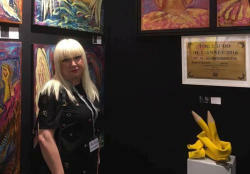 More than 500 works of the best artists from around the world are displayed here, said Narimanbekova. "I have presented nine paintings, among which are the well-known "Puppet", "The obscure object of desire", "Confessions of an Mermaid", "the Daughter of the Caspian sea" and others. Women's life and spirituality, love and disappointment, flight and fall, divinity are the main theme of my paintings", said the artist. 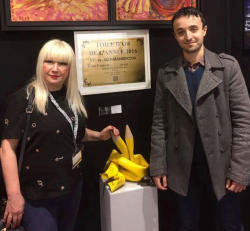 Nigar Narimanbekova, who lives and works in Paris and Baku, was graduated from Azerbaijan State Art School after Azim Azimzade and All-Union State Institute of Cinematography after Gerasimov in Moscow. She has participated in a number of national and international art exhibitions in France, Germany, Austria, and Azerbaijan.